Growing strawberries is easy and fun, and even a kid would love to grow this fruit as an adventure. 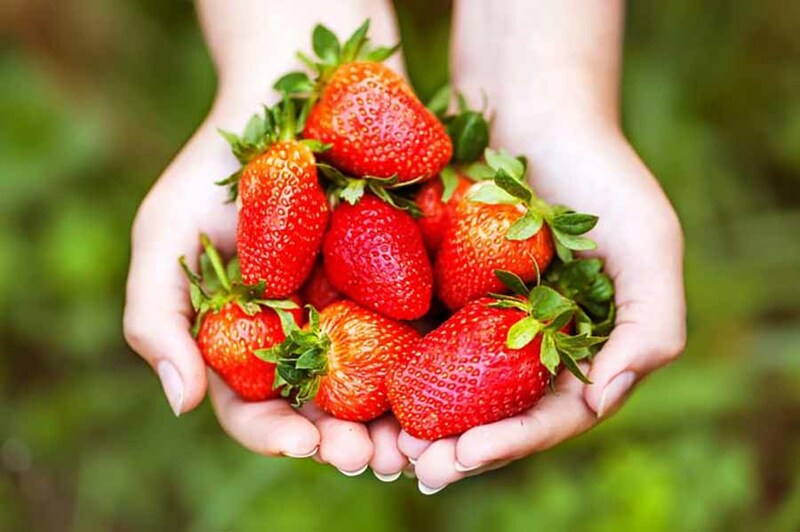 Whether you grow strawberries in home or garden, in a pot or the ground, this article will provide you with all the information required to produce fresh, healthy and juicy strawberries. Fresh strawberries with powdered sugar are a delicious summer snack. Plucked strawberries are the best, especially when they come from your garden. If you want to enjoy fresh strawberries in the summer, then you can plan the red delights the summer before. August is an ideal time to plant. You can then harvest the following year in June and July. In this article, you will not only learn how to grow strawberries but also how to handle different stages during the growth period of this fruit. Strawberries are a nice addition to your vegetable garden. In principle, you can grow strawberries on any surface, although you will achieve the best results on a slightly acidic substrate that is permeable to water. Prepare the soil for the strawberry beds extra well with a large portion of organic manure during the autumn. You can improve the quality of quickly drying soil in this way. How do you lay a strawberry bed? For a strawberry bed in the vegetable garden, it is best to raise the soil so that rainwater is drained easily. Optionally you can put black agricultural foil on the bed. With this agricultural foil, hardly any weeds appear between the plants and you can easily remove too early foothills that weaken the plants. Also, the soil absorbs heat which is a slightly earlier harvest. Finally, it keeps the leaves, the flowers and finally the fruit clean as there is no mud spraying in rainy weather. Also, you can also put straw between the plants. If your strawberry bed is laid out, you can plant the strawberry plants in rows with a planting distance of 25 to 35 centimetres. When planting, you have to make sure that the heart is just above the ground and is certainly not planted too deeply. If that is not the case, you risk that the heart will rot and not get enough light to grow. Press the soil well after planting and give little water. Strawberries do not necessarily have to be grown in full soil; they do just as well in pots on your terrace or balcony. Take a sufficiently large pot or bin in plastic or terracotta. Very decorative are special strawberry pots with lateral openings. Check whether the pot or container has sufficient drainage holes because strawberries do not like to be wet. You can make some holes yourself with a drill if that is not the case. Fill the pot or bake for half to three quarters with a good potting soil mixture or special potting soil for strawberries. Optionally you can mix some hydro or clay granules. Then carefully remove the strawberry plants from the pots. Place them on the soil mixture, fill the container with potting soil and press it. The pot may not be filled to the brim; you can better leave a space of a few centimetres, which facilitates watering. After planting you immediately water the strawberry plants. Strawberries love sun; a plant bed or a strawberry pot in a sunny place is therefore recommended. Note, however, if the sun is too strong: especially young plants may suffer. In that case, screen the strawberry bed or move the pot. Too much wind is bad for strawberries. Give them a wind-free place in your garden so that they are protected against the strongest wind. Give strawberries water and manure. Strawberries hold as mentioned before, not from wet soil, but a too dry soil is also not recommended. In principle, the potting soil must always be well moistened. Therefore, water regularly during the growth and flowering period. On hot summer days, you can even water them every day. You prefer to give young strawberry plants too little or too much manure because too much fertiliser can burn the roots. When the strawberry plants bloom, you may occasionally administer a potassium-rich fertiliser. Whether you grow strawberries in a strawberry bed or a pot, you do not have to buy new plants every year. As a multi-year crop, they can safely stay in the same place for a few years, even though you can best harvest them after two years to preserve a rich harvest. Strawberries tolerate low temperatures, but in severe frost, you have to protect them. Strawberries in a breeding bed in the vegetable garden cover with straw or branches during the coldest months of the year. You get strawberries in pots in the autumn to let them overwinter indoors. As far as the strawberry varieties are concerned, a distinction is made between single-bearing and seasonal varieties. With this type of strawberries, there is an annual rhythm. In the summer the strawberry plant forms foothills. In August and September, the days shorten, and the plant prepares the formation of the flower buds unnoticed. In October and November, the strawberry then goes to rest in the spring to form flowers and new leaves. In June and July, you can then harvest strawberries for three weeks. Elsanta is a popular single-bearing strawberry variety. These strawberry varieties make flowers all summer, so you can not only harvest in June and July but until October. That gives you more strawberries, even though they are a bit smaller than with the once-bearing varieties.